It was way back in May of 2008 that I finally decided to try to organize an online consciousness conference. Ten years later and the conference material from the resulting five online conferences is for the most part still there. There is the inevitable link rot that creeps in and I try to keep up with it but in some cases it is unavoidable. The first conference was hit the hardest because back then I used google video which went under (and somehow I lost all of the videos I had there) and hosted papers and related material on a server I can’t access anymore (I also let the custom url lapse a while back and it is now the original http://consciousnessonline.wordpress.com). A lot survives, though, and I have been glad to see people linking to it in their courses and some of the discussion (all of which is still there) has been cited in scholarly papers! I actually had the idea for a consciousness-specific online conference in the summer of 2007, and bothered a few people about trying to get something like this going over the next year or so (I vaguely remember pitching the idea of a Kripke & Consciousness online conference to the early Kripke Center in 2007). My experience at the Tucson consciousness conference in April of 2008 finally goaded me to act. I had just recently started blogging (happy 11th birthday to this blog by the way!) and seen the Online Philosophy Conference so I thought that was an ideal format (but with more video). People warned me that it was too much work and that the previous online philosophy conferences had not really succeeded. I thought if it was kept small it could be done, and since I was tired of waiting for someone else to do it, I set out to do it myself. I spent the summer getting ready, announced the conference in August of 2008 and held the conference in February of 2009 (papers published in April of 2010)…a lot of work but also a lot of fun! I organized the last one in 2013 and the final special issue I edited as a result of that came out in 2015. All in all that is seven years I invested into that project! It was a shame that I had to stop because I really enjoyed working on it and was trying to grow it into something but as I was coming up for tenure it was communicated to me that my scholarly work was excellent and that I needed to focus on contributing something to the college. In other words, another conference, and another publication was not going to help me get tenure (this is how I interpreted it anyway). So I turned my focus to organizing things at LaGuardia and I just could not do both with my teaching load (5/4 plus extra classes). I was awarded tenure in the fall of 2015 and I briefly thought about trying to revive it but by then I had kids! Plus, I have been happy to see the Brains Blog, and their Minds Online Conference (and now Neural Mechanisms Online) spring up to fill the void (by the way, here is the excellent special session for CO5 organized by John Schwenkler). One thing I have learned is that it is possible for one person/a small group of people to make an impact but what we really need is to ‘institutionalize’ online conferences, by which I mean have them sponsored by professional organizations like the APA or the Association for the Scientific Study of Consciousness (or the Tucson Center for Consciousness Studies, etc) but it is not clear how to do that without money entering the picture (I footed the small bill for any costs related to running Consciousness Online and everyone else worked for free!). The thing I am most proud of is that the conferences all resulted in publications (4 journal issues and one book). My basic idea was to have the conference itself count as part of the review process. The papers were usually rewritten after discussion and then sent out for a more traditional review before finally being published (and so the result was not just a conference proceedings but a new paper sharpened by the conference (remember I was still an idealistic graduate student at the time!)). I was very lucky to have the general editor from the Journal of Consciousness Studies initially approach me about editing a special issue and I ran with it from there. A quick check of Google Scholar shows that the six resulting papers from the first conference have (mostly) done pretty well since being published in 2010. Prefrontal Cortex, Consciousness, and…the Central Sulcus? A second source of insights are neurological patients from the first half of the 20th century. Surgeons sometimes had to excise a large belt of prefrontal cortex to remove tumors or to ameliorate epileptic seizures. What is remarkable is how unremarkable these patients appeared. The loss of a portion of the frontal lobe did have certain deleterious effects: the patients developed a lack of inhibition of inappropriate emotions or actions, motor deficits, or uncontrollable repetition of specific action or words. Following the operation, however, their personality and IQ improved, and they went on to live for many more years, with no evidence that the drastic removal of frontal tissue significantly affected their conscious experience. Conversely, removal of even small regions of the posterior cortex, where the hot zone resides, can lead to a loss of entire classes of conscious content: patients are unable to recognize faces or to see motion, color or space. So it appears that the sights, sounds and other sensations of life as we experience it are generated by regions within the posterior cortex. As far as we can tell, almost all conscious experiences have their origin there. What is the crucial difference between these posterior regions and much of the prefrontal cortex, which does not directly contribute to subjective content? The assertion that loss of the prefrontal cortex does not affect conscious experience is one that is often leveled at theories that invoke activity in the prefrontal cortex as a crucial element of conscious experience (like the Global Workspace Theory and the higher-order theory of consciousness in its neuronal interpretation by Hakwan Lau and Joe LeDoux (which I am happy to have helped out a bit in developing)). But this is a misnomer or at least is subject to important empirical objections. Koch does not say which cases he has in mind (and he does not include any references in the Nature paper) but we can get some ideas from a recent exchange in the Journal of Neuroscience. One case in particular is often cited as evidence that consciousness survives extensive damage to the frontal lobe. In their recent paper Odegaard, Knight, and Lau have argued that this is incorrect. Below is figure 1 from their paper. This is brain of Patient A, who was reportedly the first patient to undergo bi-lateral frontal lobectomy. In it the central sulcus is labeled in red along with Brodman’s areas 4, 6, 9, and 46. 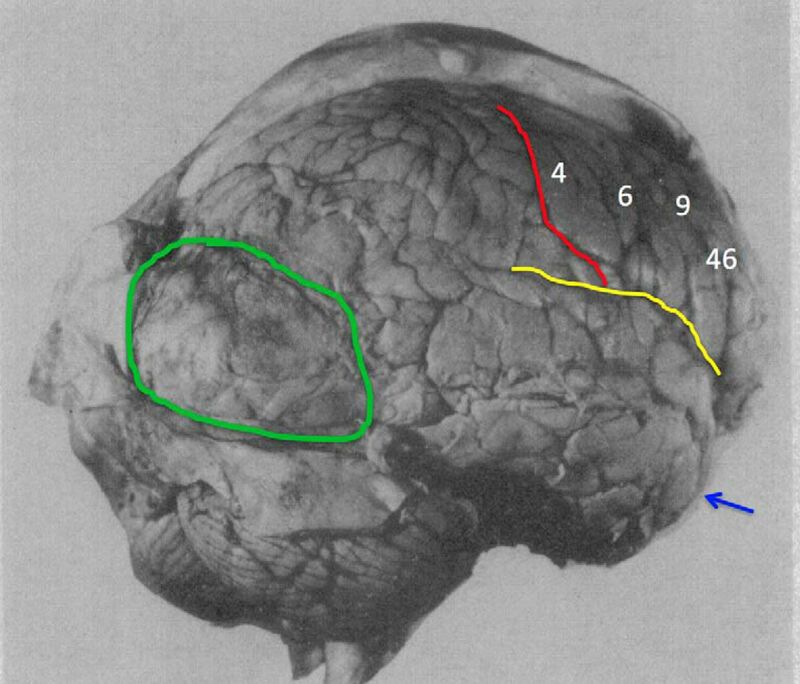 Labled in this way it is clear that there is an extensive amount of (the right) prefrontal cortex that is intact (basically everything anterior to area 6 would be preserved PFC). If that were the case then this would hardly be a complete bi-lateral lobectomy! There is more than enough preserved PFC to account for the preserved conscious experience of Patient A.
Boly et al have a companion piece in the journal of neuroscience and a response to the Odegaard paper (Odegaard et al responded to Boly as well and made these same points). Below is figure R1C from the response by Boly et al. Close attention to figure R1C shows that Boly et al have placed the central sulcus in a different location than Odegaard et al did. In the Odegaard et al paper they mark the central sulcus behind where the 3,1,2 white numbers occur in the Boly et al image. If Boly et al were correct then, as they assert, pretty much the entire prefrontal cortex is removed in the case of patient A, and if that is the case then of course there is strong evidence that there can be conscious experience in the absence of prefrontal activity. So here we have some experts in neuroscience, among them Robert T. Knight and Christof Koch, disagreeing about the location of the central sulcus in the Journal of Neuroscience –As someone who cares about neuroscience and consciousness (and has to teach it to undergraduates) this is distressing! And as someone who is not an expert on neurophysiology I tend to go with Knight (surprised? he is on my side, after all!) but even if you are not convinced you should at least be convinced of one thing: it is not clear that there is evidence from “neurological patients in the first half of the 20th century” which suggests that the prefrontal cortex is not crucially involved in conscious experience. What is clear is that is seems a bit odd to keep insisting that there is while ignoring the empirical arguments of experts in the field. On a different note, I thought it was interesting that Koch made this point. IIT also predicts that a sophisticated simulation of a human brain running on a digital computer cannot be conscious—even if it can speak in a manner indistinguishable from a human being. Just as simulating the massive gravitational attraction of a black hole does not actually deform spacetime around the computer implementing the astrophysical code, programming for consciousness will never create a conscious computer. Consciousness cannot be computed: it must be built into the structure of the system. This is a topic for another day but I would have thought you could have integrated information in a simulated system.